Authority - is the lead the decision maker? Need - are your products or services a good fit for their needs? Urgency - are they ready to buy now? If not, when? Money - can they afford you? I know what you're thinking. What happened to BANT (Budget, Authority, Need, Timing)? According to Ken Rogue of InsideSales.com, "BANT went out of style about three years ago when a research study done by DemandGen found that only 20 percent of companies have an annual budget that they make purchase decisions from." So authority is crucial as a first step now, and money will work itself out of need and timing. But how do we get the answers to these questions from content alone? Who has control over the purse strings? Who will sign the contract or at least order its signing? The first step is a well-thought-out persona analysis based on interviewing your sales team and customers. You should be able to ascertain patterns from your typical buyers and develop a reliable description of your target decision makers and of the other stakeholders in the decision process. Next, you need to create a content map for each buyer persona based on the content your buyers have already consumed, the kinds of content that are popular in the places they hang out—like LinkedIn Groups, Google+ circles or top-ranked blog syndication sites, for example. Develop content for each stage of the content map and compile it into ebooks, videos, blog posts and social media updates. Now create demand generation and lead nurturing campaigns to reach out to these folks and keep them engaged. How is this qualifying your leads? You are prequalifying them by reaching out directly to decision makers instead of to the broader masses. This strategy may net you fewer leads than a broader campaign, but you are far more likely to convert them into marketing qualified leads and eventually into customers. The other important piece of information to derive from your persona analysis is need. What are the common pain points of your buyers? Why did they buy from you instead of your competitors, and what problems have you solved for them? It couldn't hurt to ask them directly when they download your content, so consider asking, "What are your biggest challenges?" in your forms and online surveys. Now you need to assess your strengths relative to those needs and focus your messaging on them. Your mission now is to establish yourself as a thought leader in the space where those needs scream the loudest. Blog about common pain points and solutions—that's what I'm doing now. Engage with your target persona group in their favorite social networks, asking and answering questions about those pain points. In the spirit of inbound marketing, don't push your solutions, just offer your expertise. The rest will follow. How is this qualifying your leads? You are appealing directly to their desire to find solutions for their needs. In addition, you are placing yourself above your competitors—so now we're potentially well into that inside sales call without a call being made. There are a few easy ways to test this. Most obvious, you can simply ask the question in your content download forms. A simple multiple choice question on when a purchase decision is likely will work fine. If that seems too intrusive, you can leverage marketing automation. Track the time between first touch and most recent touch (download etc.). Look at the frequency of visits and length of stay. If those things are increasing, you are looking at a sense of urgency. Give your leads plenty of opportunities to skip the mid-funnel and go straight to sales-readiness with calls-to-action for demonstrations, free trials or sales consultations. You want to remove as many barriers as possible to a lead's end desire. How is that qualifying leads? Well, you're either getting a handle on how interested your leads are in terms of timeframe or you are accelerating them directly to a sales call without any intermediate step. How could that be a bad thing? This one's pretty easy, too. We do it by publishing our prices, then referring to them in every services page and landing page for sales consultations. Before you contact us, you should have a very good idea what the cost is. That will surely chase away the majority of potential clients that aren't qualified based on budget. And yes, it certainly reduces the number of conversions we might get otherwise. But that's the point, isn't it? We don't want to waste our time on unqualified leads any more than any other sales rep. For the ones who get through the net anyway, they usually either failed to do their homework or didn't understand our pricing for some reason. We have trained ourselves to ask the right questions early on in a sales consultation to quickly disqualify any of those. Does Content Marketing Replace the Inside Sales Rep? Absolutely not, but it certainly can make their job a lot easier and increase success rates. With content marketing combined with marketing automation, we can create content, processes and information streams that make sales teams far more efficient and productive. 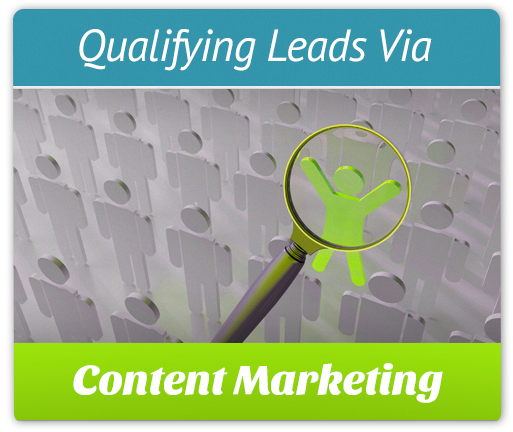 By prequalifying leads through content, we can significantly increase close rates while reducing the sales cycle. I know these are big claims, but there are many well-documented use cases. In my next post, I'll highlight some of those success stories.